Always happy to go back to my cozy kitchen and cook some more Indonesian food. Lately we have been going out more frequently. With warmer weather, being outdoorsy is one of the best choices for me and the kids. And picnic is usually a pack-and-parcel with that. Therefore I need to have a good stock of yummy, healthy snacks for our adventure outside. 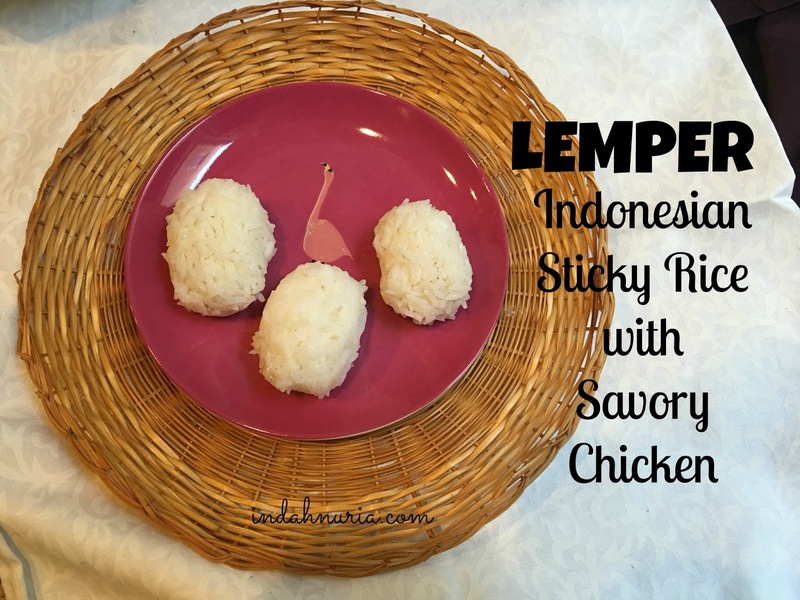 And Lemper - or Indonesian Sticky Rice with savory chicken filling (such a long name because we have no exact translation for that) is one of the yummy Indonesian snacks that my kids love so much. And it's easy to prepare it as well :). Perhaps, to those who haven't tried lemper before, it's like a rice ball. But not really a round ball, as the shape is more like an oval one :). Originally, it's wrapped with fresh, green banana leaves. 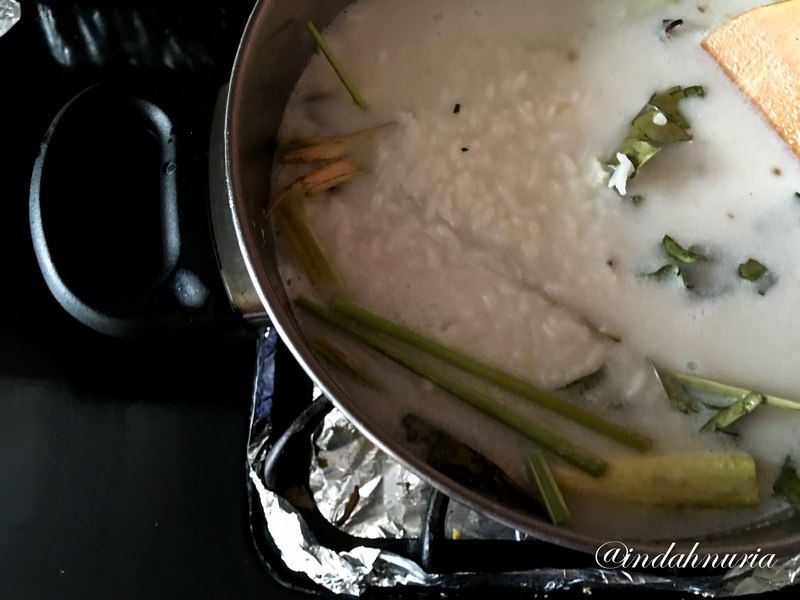 Because besides the great and fresh looking from the leaves, it gives you extra appealing aroma while the sticky rice and the savory chicken are steamed. 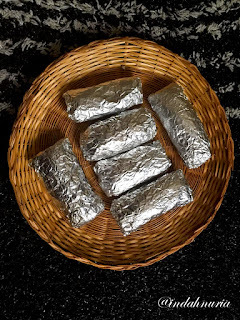 But, as I am low in fresh leaves department here in NYC, I, unfortunately, have to change it with aluminum foil. Not as pretty as the original version, but it's not that bad either. First, we get the sticky rice ready. 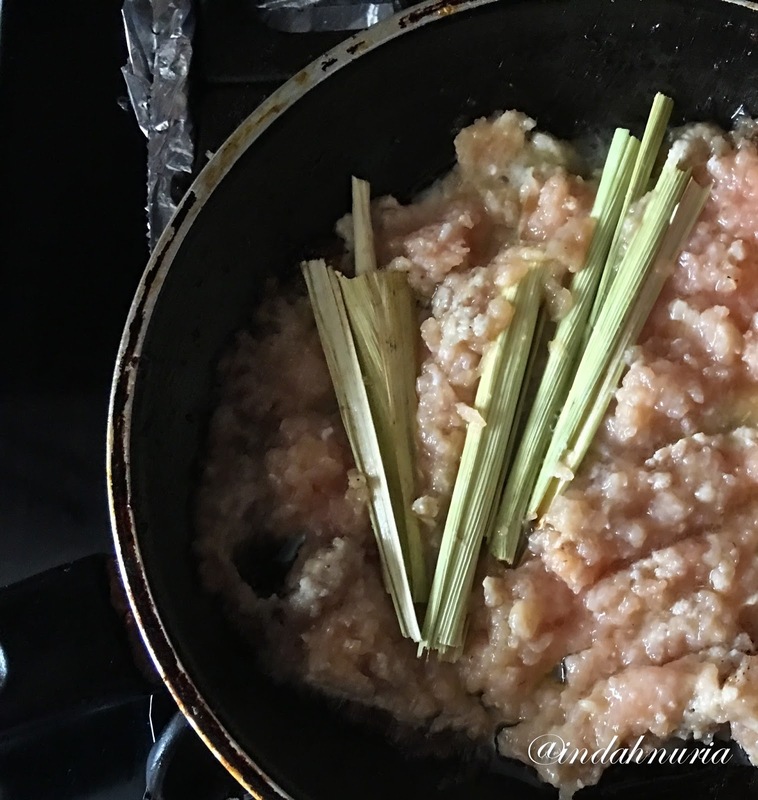 After you clean the sticky rice or glutinous rice in a pan, put water, coconut oil, lemon grass, bay leaves and salt and mix it together. I usually use a traditional way of determining how much water I need, by using my finger. Yes, my finger. One part of the finger's phalanx (that's the name, right) on top of the rice, that's the height of water I use. It might not be scientifically proven but it works for me. I always manage to get a well amount and balances steamed rice, not to dry, not to runny. So feel free to try my centuries-old-techniques :). After we mix it all, bring it to boil, use low heat to dry the excess water then put the lid on for about 20 minutes. I prefer using my steamer to get a better result. 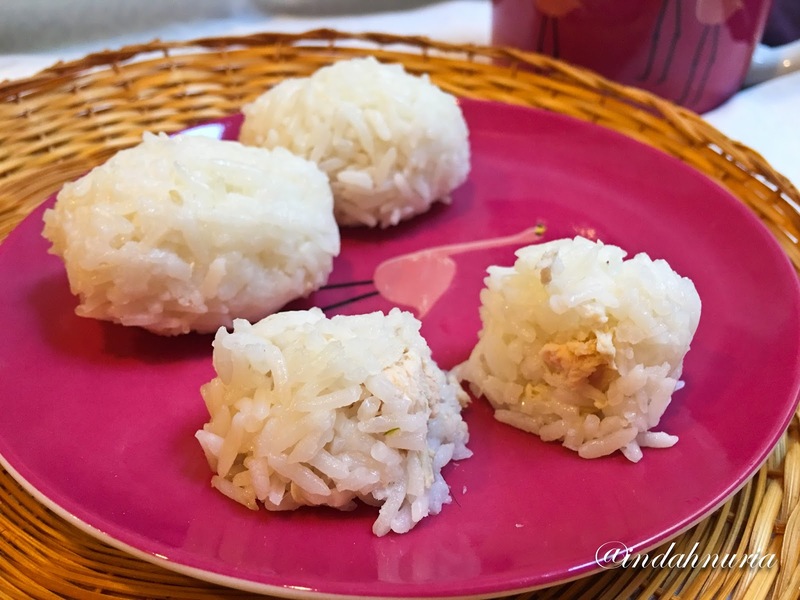 Once the sticky rice is ready, set it aside and let's prepare the filling. Put the veggie oil on a non-sticky pan, saute shallot, garlic, onion, coriander, and candlenut until fragrant and put the minced chicken. Cook it well and add lemon grass, bay leaves as well coconut milk. Cook it with low heat until all is well mixed and tender. Now, time to wrap it! 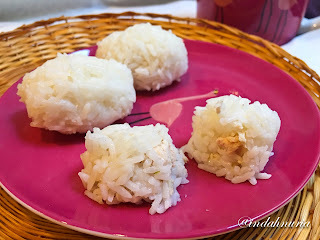 Take a spoonful of sticky rice, spread it on the aluminum foil and add a bit of the chicken filling. Put a half spoonful of the sticky rice to cover the chicken and shape it as you wish, but perhaps oval is the easiest one as we will then wrapped it with the aluminum foil. Steam it for 15 minutes until the rice is well cook and well blended with the chicken. Hope you enjoy it and have fun this summer! Here in Nebraska you could use corn leaves possibly. It looks so good! It does look super yum! 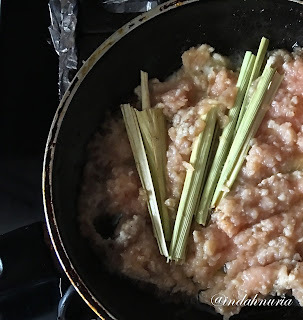 Sticky rice is one of our favorites for dinner. Baru kali ini liat lemper pakai almunium foil :)), susah ya mbak dapetin daun pisang di sana? Looks yummy... I love introducing a variety of foods into my boys diet. I usually pick recipes to go along with the geography books we're reading and an area we're learning about. Pinned. Eaaaa.... malem2 liat lemper. Lapar uyyy. ha..ha..
Mama Bo rajin banget sih ke dapur. Ha..ha..